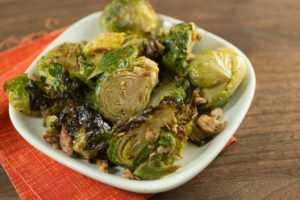 These sautéed and braised sprouts are the perfect cold weather side dish for your favorite roasts, but also go nicely with grilled chicken or steak. Cook the bacon in a heavy skillet until crisp. Remove with a slotted spoon and set aside. 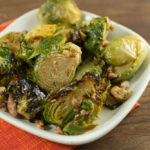 Add the garlic to the skillet, cook for a minute, and then add the sprouts. Cook until browned and add the broth. Bring to a simmer, and braise for 15 minutes, until tender. Serve topped with the reserved bacon.